It's been a while since I have gotten any pumpkin beers from the local grocery store, but this week I managed to nab a 32 oz. growler of Saranac Pumpkin Ale. To the Drunken Jackos rating scale!! 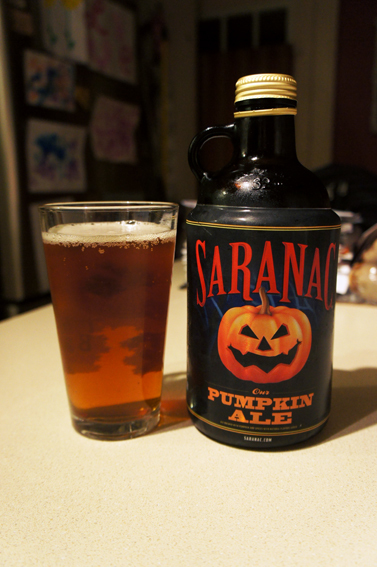 Saranac's Pumpkin Ale pours a nice rich copper hue with a slight bubbly head. 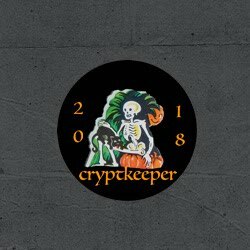 You immediately get the sweet pumpkin note, due in part to the high concentration of pumpkins used during the brewing process. That strong pumpkin scent transfers over to the taste, supported by the sweetness of cinnamon and ginger. This one really gave me a "pumpkin pie" flavoring, ending with a slightly dry malt aftertaste. It's a great pumpkin beer that really sits on the sweet end of the scale. And with the purchase of the growler size, you get a couple of beers out of it. With the unique sweetness of this beer, Saranac Pumpkin Ale gets 3 out of 5 Drunken Jackos. Definitely recommended for someone looking for a dessert in their beer! Dang, that sounds good. I hafta try it. Plague, I can't argue with that. I don't have a 2.75 so I just rounded it up. I did like the sweetness of it, though.